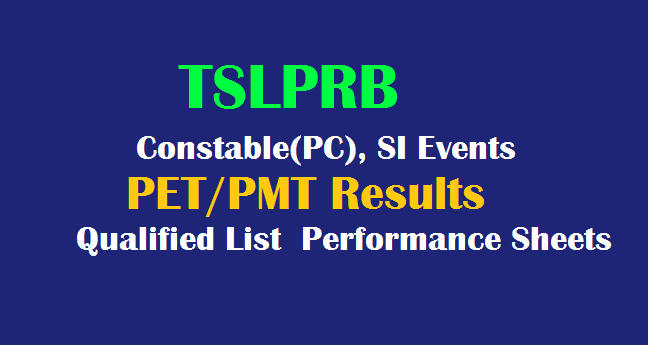 TSLPRB Events Qualified List 2019 TS Constable(PC), SI PET/PMT Results Performance Sheet PDF TSLPRB PET & PMT Result/Performance Sheet 2018-2019 TSLPRB PET & PMT Result 2018-2019 Telangana State Level Police Recruitment Board(TSLPRB) has released 99.23% Performance Sheets of the 1,16,022 Candidates pertaining to the last 17 Days, (up to 1st March Events). Physical Measurement Tests and Physical Efficiency Tests (PMT / PET) in the ongoing process of Recruitment have been conducted from 11th February 2019 onwards at 11 Venues: Amberpet (32 Days), Yousufguda (31 Days), Kondapur (31 Days), Warangal (31 Days), Khammam (29 Days), Karimnagar (26 Days), Nalgonda (26 Days), Mahbubnagar (22 Days), Adilabad (15 Days), Nizamabad (13 Days) and Sangareddy (11 Days) and the PMT / PET Process finally concluded more than 10 days ago at the end of the 2-Day Session held by a Committee of Chief Superintendents and Experts at the SAR CPL Amberpet, Hyderabad on 28th and 29th March to resolve any Court / Data-Discrepancy related and all such / similar backlog issues of all the 11 Venues of PMT / PET. PMT / PET Final Reports are available in the individual login areas of the Candidates on the TSLPRB Website. be achieved due to day-wise specialization and focus on particular set of events. the 16,925 Notified Posts of PC Civil and/or equivalent. the Candidates, on the whole. only 20% in the previous Recruitment). who appeared in FWE in the previous Recruitment. TSLPRB Constable(PC), SI Events PET/PMT Results Qualified List 2019 Performance Sheets PMT / PET Final Reports are available in the individual login areas of the Candidates on the TSLPRB Website.